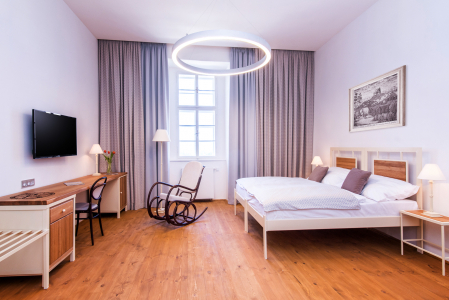 The spacious and stylishly equipped room on the second floor of the Hotel & Chateau Svijany offers an unbelievable view of the Bohemian Paradise, as if in the palm of your hand. The room is easily accessible by lift. 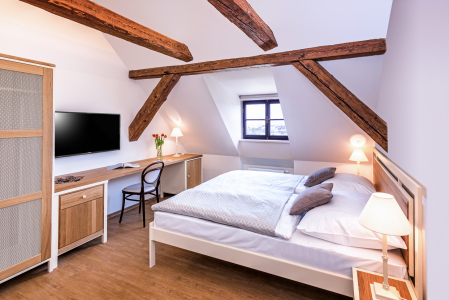 The cosy, modernly equipped double rooms are located in the chateau attic. All the rooms have their own sanitary facilities. 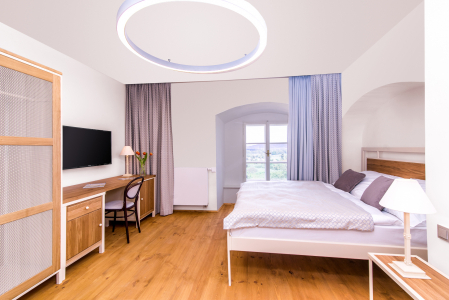 Each room is equipped with an television and Wi-Fi connection. 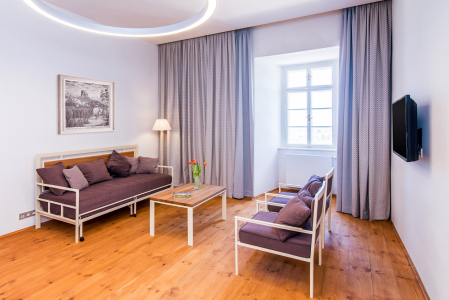 The triple room is ideal for a family with a child or three friends who intend to explore the beauty of the Bohemian Paradise. Hotel & Chateau Svijany has two stylishly equipped triple rooms. Treat yourself to a romantic night at the chateau in a spacious suite, which consists of a bedroom and stylish living room. A designer bathtub is located directly in the bedroom for a romantic shared bath. Enjoy luxury just for the two of you. Hotel & Chateau Svijany offers one comfortable four-bed suite suitable for a family or group of friends. The two separate bedrooms are joined by an elegantly furnished living room with a bed sofa. The living room is suitable for spending time together. The chateau has two four-bed suites with two bedrooms each with their own bathroom. Suites for families or groups of friends. The suites are ideal for those who visit us in larger groups. Family apartment Exclusive offers unique background for families with children. Consists of two separate rooms, two bathrooms, a living room and a spacious kitchenette.